Thanks for this design. It looks like Mackintosh, that I love. This file is exquisite.........absolutely gorgeous! Thank you so much.....I LOVE it! 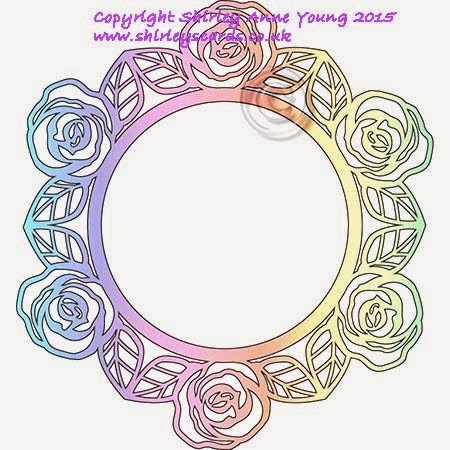 This is beautiful Shirley a really lovely frame and love the shape in between the roses too. Thank you for your generosity. Thanks so much for the frame! You are always so generous and thoughtful. Merci Shirley pour ce joli partage, j'adore ces roses. Thank you, Shirley, for yet another beautiful file! Thanks for another beautiful frame Shirley. Thank you for the beautiful circle Rose Frame. Just wanted to say thank you for sharing this gorgeous file. Also thanks for stopping by my blog and leaving such neat comments. I still haven't gotten into making many cards but I make one here and there as the occasion demands. I need to get cracking and make a 60th wedding anniversary card soon. So I better take a good look through my files from you for inspiration.